We left Nebraska while it was burning up - both literally and figuratively. The temps were soaring in the triple digits and the northwestern part of our state is on fire. The drought is taking it's toll on our state. Did anyone ever record a song about Wyoming? I'll have to Google and find out. I think I love Wyoming like John Denver loved Colorado. The mild temperatures (and did I mention no humidity). The mountain ranges. It raw beauty. 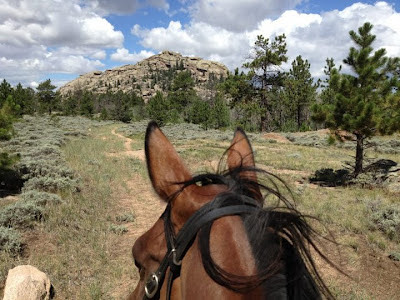 It's our second trip to Wyoming with the horses and by far the best. The first one had nothing to do with the state itself but perhaps our state of mind at the time. This one has more than made up for it. I barely have enough Mifi signal to pull up this page. I can't share Wyoming with you without accompanying pictures. And there are lots of pictures on my camera, my iPhone and in my mind. And I can't wait to upload them. But for now, just a sneak peek. When I grow up, I am moving to Wyoming. At least from Father's Day until Labor Day. Stunning countryside!! You need to come visit Oregon sometime...lots to see and mild temps. Your horse is beautiful too - now, there's some beautiful scenery! That's me, and CO - but that's because I've never been to Wyoming! One of these summers...looking forward to seeing & hearing more about your trip!! The only Wyoming song I can think of is "Good Ride Cowboy." I fell in love with Wyoming when we drove through it! Gonna get back there one day - there's quite a few endurance rides.